Within the global fruitpacking sector, more is usually considered better: more variety,more markets to tap—certainly many a business has tapped that plan to great financial success.But one Canadian company has shunned the ‘more is more’ mentality, and has instead found global renown and success with its niche business plan.Founded in 1929 by Michael Leonard Catania at the onset of the global depression, M.L. 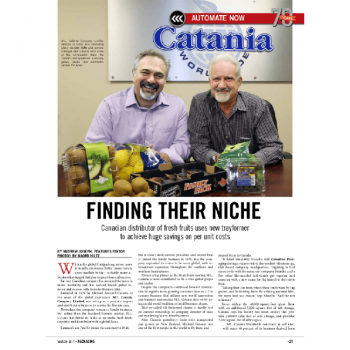 Catania Company Limited was set up as a produce import and distribution business to service the Toronto area. Nowadays, the company remains a family business,but rather than the localized Toronto market, M.L. Catania has found its niche as an exotic fresh fruits importer and distributor with a global focus.